How Far North Can Coconut Trees Grow? What Is the average size of a coconut palm tree? In tropical regions where they grow like weeds, you'll sometimes find a coconut that has begun to sprout. Look for existing mature coconut palm trees in areas that are not closely tended, such as parks and botanical gardens, because the grounds crews in these places remove fallen coconuts. If you look for a small green growth protruding from a coconut on the ground, you can take it home and plant it. Choose an area that receives full sun and has sandy or well-drained soil. Coconut palms do best in tropical coastal areas and not at higher elevations. Dig a planting hole that is 3 feet deep by 3 feet wide. Mix sand and loamy topsoil with the soil you dug from your planting hole: A good ratio is one-third sand and two-thirds topsoil. Backfill your planting hole about one third full with the soil mixture and then water it well. Add more soil mixture and water again. Set your sprouted coconut into the hole, burying it so only two-thirds of the coconut is covered. Leave the sprout on the top side of the coconut pointing upward. Water your new planting once a week if rains do not do the job. Fertilize your young tree with a 20-10-20 fertilizer when it is six months old. Choose a coconut shell that is as round as possible. Drill two holes in one end and drain out all of the coconut water. Cut the coconut in half using a saw, or hit it with a hammer to make it crack. Once you have two halves of a shell, remove all of the coconut meat with a sharp knife. Cut as close to the shell as you can, and then remove the rest of the meat with a knife, or by soaking the shell in water until it falls off. Use small-grade sandpaper to sand both sides of the coconut shell to make it as smooth as possible. Decide how big you would like your spoon. Many people make large coconut shell spoons for decoration, and others want to make smaller ones to actually use. If the shell is too big for your spoon, you will have to make it smaller. One method is to use large-grade sandpaper to remove the rest of the unused shell. You can also use a jigsaw to cut the shell to the right size. When making a small spoon, you can use your saw and sandpaper to make a spoon handle. When using the entire shell to make a large spoon, you can attach a handle to the spoon once it is finished. Some materials to use for this type of handle include sanded wood, another coconut shell, or even plastic or marble. The spoon should be already mostly formed, due to the natural curve of the shell. Once you have it sized, switch to the largest-grade of sandpaper and ball up the sandpaper. Dig out the rest of the bowl of the spoon with the sandpaper. You will remove very slight amounts of shell at a time, so prepare yourself for a long evening's work. Select a coconut in which you can hear the water when you shake the nut. Do not remove the husk. Soak the nut in a bucket of water for about three days before planting. Fill a 10-inch-deep and equally wide container with a good-quality, well-draining potting medium. Place the coconut in the soil with the pointed end downward and the part that was attached to the tree facing up. Keep 1/3 of the nut above the soil level. Water the planted nut frequently enough to keep the soil moist. Do not over-water. Place the pot in a warm area with a consistent temperature of over 70 degrees F and ideally over 80 degrees F.
The palmetto weevil (Rhynchophorus) is native to Florida. According to the University of Florida, this is the only palm weevil species residing in the United States. Adult bugs typically assault larger palm trees at the crown leaves. Larvae feed inside the tree. Trees are known to fall over from the crown due to the extensive damage palmetto weevils cause, according to the University of Florida. Unfortunately, destruction of infested trees is the only treatment to prevent spreading of these bugs to nearby coconut palm trees. The fruit coconut mite (Aceria Guerreronis Keifer) eats immature coconut fruit. This bug is barely visible with the human eye. Huge colonies grow inside and on the coconut trees. The bugs eat away at immature fruit, causing extensive scarring and even early coconut drop. According to University of Florida IFAS Extension, the largest incidences of this coconut mite are on trees in the Florida Keys region. The general coconut mite (Acathrix trymatus) does less damage to coconut trees than the previously described mite and has a lower population. While this bug is most common on trees with lethal yellowing disease, the mite is not the cause. Large colonies of the bugs populate diseased, young coconut trees and eat the leaves. Coconut palms (Cocos nucifera) grow only in the warmest areas of USDA zones 10 and 11--southernmost Florida, for example. Zone 10's average annual minimum temperature is 30 to 40 degrees F. Zone 11's average annual minimum temperature is above 40 degrees F.
Pick out a coconut from the grocery store or a produce market. The coconut should be brown and hairy and you should be able to hear the liquid slosh in it when you shake it. 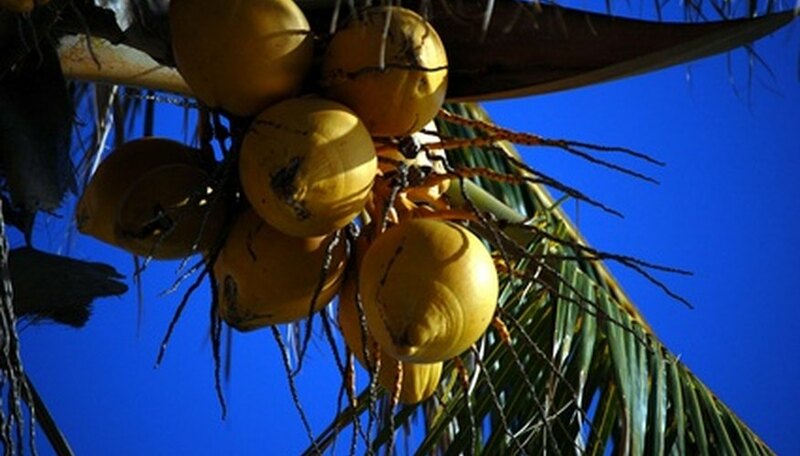 Soak the coconut in water for 2 to 3 days before planting. Get a bucket, one large enough that you can put in at least 10 inches of soil. Put holes in the bottom of the bucket to ensure adequate drainage. Put a layer of gravel in the bottom of the bucket to also help with drainage. Place the bucket in a very warm place that gets a lot of sunshine. Plant the coconut with about 2/3 of the nut covered in soil and the top 1/3 above the surface of the soil. Water the coconut frequently. It will take at least 4 months, and possibly up to 6 months, for the coconut to sprout. There is no reason to fertilize your coconut for the first 6 months. During that time, it lives off of the nutrients within the coconut itself. Transplant the coconut into the ground after about 4 to 5 years. At about 4 years, it will begin developing a trunk, and within 6 years it will have its first flowers. At full maturity, a coconut tree can produce up to 200 coconuts in a single year. Roll out the coconut liner and cut a piece that will fit your container. Install it by pushing it into the inside of the planting container. Trim a plastic bag to fit inside and liberally poke holes in the bag. This will help keep your pot from drying out so quickly but will allow drainage. Fill the liner up with potting soil. Insert the plants as you want them. To plant around the exterior of the pot, poke holes in the coconut fiber with the scissors. Slice the liner a little to widen the holes. Then push the roots of your plants through the liner and into the soil. Put a hand inside the container and firm the soil around the slits in the coconut from inside the pot. Water a coconut fiber planter frequently in summer. The liner is permeable and much of the moisture will evaporate during the day. Water until the fluid runs out of the planter on a daily basis. Watering in other seasons can be done when you feel the soil is dry to the touch. Coconuts are harvested by climbing coconut trees and using a large knife to cut at the base of the stalks, freeing coconut bunches to either fall or be lowered to the ground with ropes. Coconut plants produce white flowers and green leaves that stay on the plant year-round. The flowers appear when it is four years old. The coconut plant will reach a mature height of about 60 feet. The coconut plant will not survive in areas where the winter temperatures fall to 18 degrees or lower. Temperatures below 32 degrees will cause damage. It can be found in Florida, Hawaii, North Carolina, Puerto Rico and the Virgin Islands. Plant the coconut plant in a hole that is at least 60 inches deep to allow for the roots to spread. 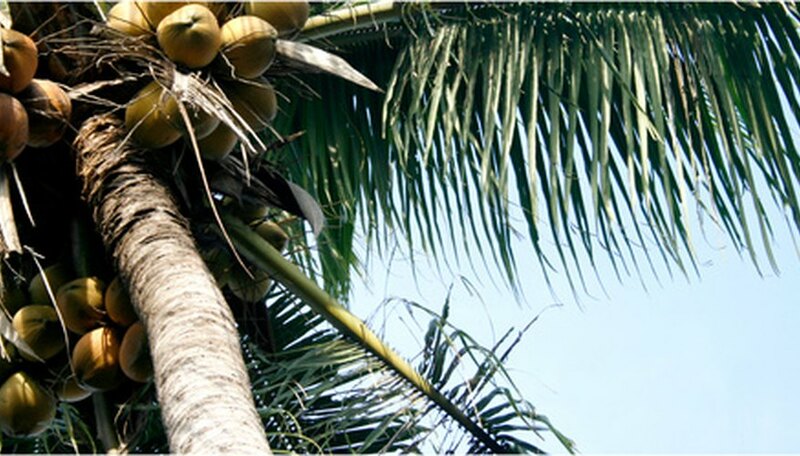 The coconut tree is used to make food, fibers, building materials and chemicals. It is also used as a shade tree in salty areas where other large trees will not survive. The coconut plant is susceptible to lethal yellowing, bud rot and trunk rot. Insects such as scales, palm aphids, spider mites, mealybugs, palm weevils and caterpillars can also cause problems. The average size of a coconut palm tree is approximately 50 to 70 feet. The tallest coconut palm trees reach heights ranging from 80 to 100 feet. Dwarf coconut palms, the smallest variety of the tree, reach a mature height of 30 to 60 feet.